On Friday at Nassau Coliseum, the Penguins had a brutal first period where they sleepwalked through the first 20 minutes, got outshot 14-3 and watched the Islanders take a 1-0 lead into the first intermission. But steadied by the play of Tomas Vokoun between the pipes, the Penguins managed to find their legs and wake up for the second period to make this a game, eventually topping the Islanders 4-2 to extend their winning streak to 11 games. They have equaled the Chicago Blackhawks for the longest streak in the NHL this year, putting together their own version of March Madness by going undefeated in the month. "We’re just finding ways to win right now," said Brandon Sutter, who scored the game-winning goal. "I think we want to keep playing the way we are. We don’t really want to change much. Obviously we think we can still get better at certain things. I think if we keep that mindset, hopefully we can keep doing well." In addition to Sutter, Chris Kunitz and Joe Vitale also tallied and Pascal Dupuis sneaked in an empty-netter with less than one second left in the game. Vokoun played outstanding in goal, making a total of 33 saves. If it weren’t for his play, the score could have been a lot more lopsided. "They came hard," Sutter said. "They’re a fast team, when they’re skating it makes it tough. But we were standing around. I think after the first we kind of calmed down a bit and figured out what we had to do. Tomas Vokoun made some huge saves in the first and second to keep it a close game. We managed to get a few for him." "I’m proud of the way we battled and won this game and came back," coach Dan Bylsma said. "Talk about different guys getting goals, but our penalty kill as well, Tomas Vokoun playing real strong – definitely a big win." Vokoun got peppered with shots from the moment the puck dropped in Long Island. He faced 14 shots after one period, 28 after two and 35 total. He had his teammates’ backs during that abysmal first period, allowing just one goal despite being sieged with shots, sustained shifts in his zone and scrambles around his net, keeping the Penguins in this game. Vokoun gave an honest and insightful answer when asked what that first period was like for him. He reflected on his struggles in the game against Montreal on March 2, where he allowed six goals that evening but his teammates rallied around him and found a way to win by topping the Canadiens 7-6. He was just grateful he could repay that tonight. "I’ve been through the game this year when I was not playing so good and the team lifted me up and we won 7-6 in Montreal," Vokoun said. "That’s why it’s a team sport. We are all interconnected with each other. Some nights, you help the team and some nights, the team is going to help you. For me, as a goalie, you’re just trying to make every save. Obviously that’s never going happen, but you’re just trying to do the best you can to keep the team in the games." After Vitale tied the score at 1-1 with 11:49 left in the second period, the Islanders responded with a pair of lengthy shifts in their offensive zone that had the Penguins back on their heels. Vokoun’s save of the game came during that stretch, where he made a stop on a shot through traffic. The rebound went to Marty Reasoner in the slot with Vokoun still down from the first save and the net open. But Vokoun scooted over quickly and desperately kicked his leg up, keeping the puck out of the net with his pad! "He’s the reason we were able to win tonight," captain Sidney Crosby said. It seemed like the Islanders might go all game without getting a power play, but that changed in the third period when they got two in the second half of the frame. Their first one came with 12:27 left in the period and top penalty killer Dupuis in the box. The Penguins killed off the first 1:40 before getting a power play of their own. But as soon as that expired and the Islanders got back to full strength, Brooks Orpik hooked John Tavares and New York went back to the man-advantage with just 3:21 left in the third and clinging to a one-goal lead. The Penguins got everything they needed for a successful kill: shot blocks, clutch saves, faceoff wins, won battles and big clears. Paul Martin and Mark Eaton were beasts on the back end while Craig Adams and Brandon Sutter were strong up top. The Penguins have now allowed just one power-play goal in their last five games. The upward trend is continuing for the Penguins after a rough start to the season on the penalty kill. "We’re getting better," Adams said. "That’s a good power play over there. Obviously when you’re killing in the last five minutes and you’re up by a goal, you know there’s going to be some hairy moments. But I thought we handled it pretty well. Hopefully we can continue to build some confidence there." The guys call Brandon Sutter “Suttsy,” but maybe they should call him Clutch. OK, that may be corny, but he really is, as six of Sutter’s nine goals this season have come in the third period or overtime, with four of them being game-winners. Five of them have come during this winning streak, including the overtime winner against Montreal on March 2 to kick it off, a monstrous two-goal performance late in the final frame to lift Pittsburgh over Boston on March 12 and now the game-winner tonight in Long Island. Just 1:46 into the third period, James Neal hit Matt Cooke with a pass, allowing him to go on a 2-on-1 with Sutter. Cooke deftly slipped a pass around prone defenseman Matt Carkner, who had slid to try and block the lane. Sutter got it and beat Nabokov to put the Penguins up 3-2. "Made the play up the wall to Neal," Sutter explained. "He threw it up to Cookie. I was just coming through with speed and their D went down. Cookie just stepped around it and I’m just waiting for the shot. It went in. it was a great play by both wingers and great job by the D getting it up ice." Kunitz also scored a clutch goal with just 13.8 seconds left in the second period to tie the score and give the momentum back to Pittsburgh heading into the third (where Sutter quickly got the Penguins the lead). Kunitz’s line was at the end of their shift, but Sidney Crosby found the strength to keep his legs churning and carry the puck into the zone. 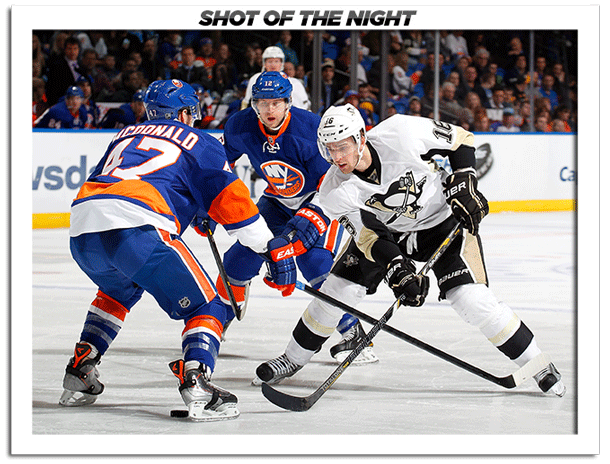 He send a perfect cross-ice pass to Kunitz, who drifted to the slot and sent a shot through Nabokov’s pads. Despite playing the night before, the Islanders – fighting for their playoff lives – completely and utterly dominated the rested Penguins in the first period. The Penguins struggled to get pucks behind their D and deep into the zone, allowing the Islanders to get clears and gain the offensive zone – where they kept possession and got sustained shifts. They were executing; the Penguins were not. All seemed lost. Until the fourth line went out for an offensive zone faceoff with just under two minutes left in the period. Vitale, Craig Adams and Tanner Glass did what they do best: grind the opponent down. They moved the puck, won battles on the boards, created traffic in front and got shots to the goal, eventually forcing tired defenseman Matt Carkner to take a penalty. It was an excellent shift and just what the doctor ordered for the lethargic Penguins. That line came up big again just under halfway through the second period. A dump-in attempt from Simon Despres hit an Islanders skate and went to Adams in the neutral zone. He threaded a nifty little pass to Vitale entering the zone, who picked his spot and sniped a shot top shelf, far corner for his second goal in three games – an absolutely crucial goal for the Penguins. "It was an unbelievable shot," Adams marveled. "I was behind him so I had a good view of it. Sometimes you’re tempted to pass on a 2-on-1, but they gave him some room and he put it right where he wanted to." The Penguins, already missing Evgeni Malkin (upper body) and Kris Letang (lower body), lost another player when forward Tyler Kennedy did not play in tonight’s game due to illness. Trevor Smith, recalled late in the afternoon from Wilkes-Barre/Scranton, took his spot in the lineup. Smith skated on a line with Dustin Jeffrey and Beau Bennett.